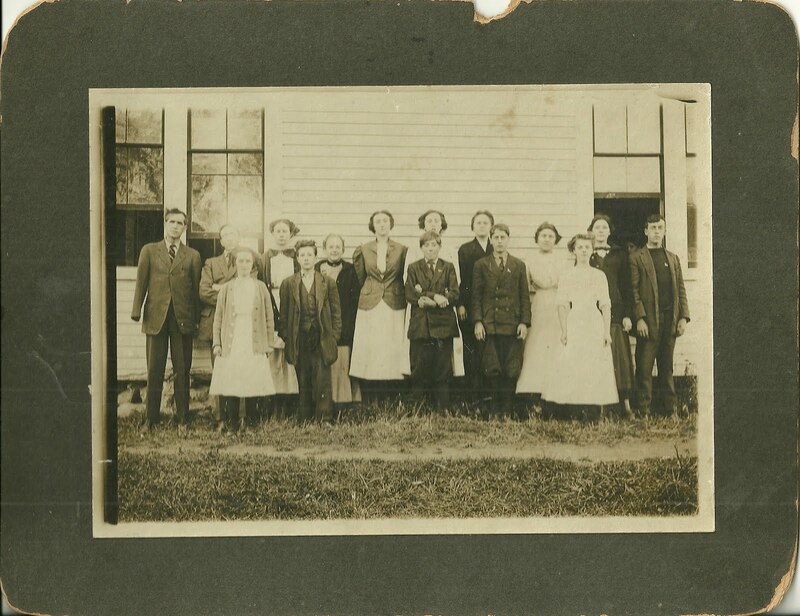 Assuming I've correctly interpreted the identification key to a group photograph of teacher and students at Surry High School in Surry, Maine, the young lady above is Ethel Marie Lord. The photograph was taken by Guy Linwood Carter of the Photo Shop at Blue Hill, Maine. See another post that features the group photograph and its identification key. Ethel Marie Lord was a cousin to Mildred Laura Lord, discussed in an earlier post; Mildred is standing to the left of Ethel, as viewed in the photograph. Ethel Marie Lord was born July 24, 1895 at Surry, Maine, the daughter of Oscar Clarence Lord and Millie Ardelle (Gaspar) Lord. On September 16, 1929, Ethel married William Potter Leonard, son of Samuel and Clara Augusta (Bartlett) Leonard. They made their home on Mount Desert Island and had at least one child. Ethel taught school. Ethel died in 1966 and William in 1971. They're buried in the Pretty Marsh Cemetery at Pretty Marsh on Mount Desert Island.